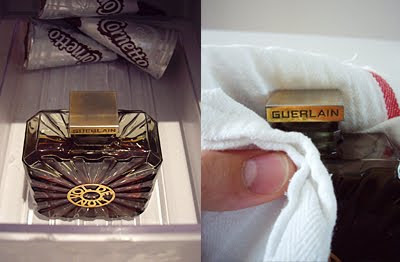 Sorcery of Scent: FAQ: How do I remove a perfume stopper that's stuck? All worked out smoothly, but my nerves were blank...You can see this lovely undamaged bottle in my blog. I still tremble, when I think of this adventure. Will try your way next times ! So no hammers then Dimitri ? So far I have not had too much trouble but if I had a bottle of a vintage Mitsouko sense might go out the window. I shall show the instructions to my husband who will tie me to a chair ,tape my mouth and make me watch as he does a lovely job ( shut up in the peanut gallery)....I tear Christmas paper off like a loon too. Thanks for the tip. I haven't heard of using oil before, but have had success using a pipette with drops of alcohol to loosen vintage crystal stoppers stuck fast due to perfume resins. One advantage of alcohol is less concern about it contaminating the perfume. It is a little nervewracking trying to open a valuable vintage bottle! Thank you for posting these tips. I have a couple of bottles I want to try to get unstuck. Angela, you're hilarious! I totally know what you mean! 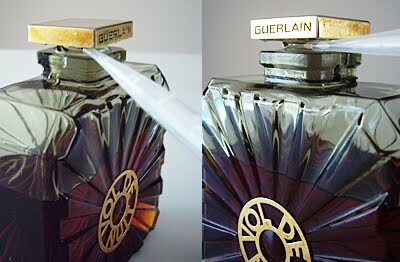 GGS, non-scented perfumers alcohol is great for breaking down the residue, but I find it evaporates too fast to act as a lubricant. Queen Cupcake... please let me know if this method works for you! Wow, my husband just did a mind-blowing job of removing a broken-off stopper from a bottle of vintage Chanel 5 that I got for a song. I took a bunch of pictures but am not sure I'll be able to post them here; I'll try. It's a 3-oz (my best guess) bottle of pure extrait from sometime between 1924 and 1950 - see the dot under the "No" in the pics. That's right, 3 ounces - the bottle is more than 3" high by 3" wide by 1.25 inches deep! I just put on a dab and my eyes rolled back in my head. 1) First he filed a flat spot on the broken stopper top so the drill bit wouldn't slip, then he used a drill press with a 1/8" carbide glass-cutting bit at a very slow speed, with a very small amount of water dripped on to cool it. He paused frequently to clean away the glass dust slurry. 2) After drilling down about 1/4", he put a drop of 2-part epoxy in the hole, and inserted a steel pin (he says if he did it again he would square the end of the pin first to prevent it from turning in the hole). He first flattened the end of the pin that protruded so that he could grasp it with a vise grip. 4) He put a tiny amount of vegetable oil around the seam between the stopper and the neck, and wrapped a hot wet paper towel - microwaved - around the neck (not allowing it to contact the bottle and heat the perfume). 5) He grasped the pin with vise grips and tapped smartly upward on the vise grips with a small hammer while holding the bottle on a towel to cushion it. 6) VOILA! the stopper lifted out and then a careful wipe of the neck to remove the oil residue, and I have a lifetime supply of pure Chanel 5 perfume! My hero. *I just tried to paste the photos and couldn't, but if you let me know how to do it I'll add them. They're instructive. Thank you so much for sharing your experience. I have followed your instructions (but using a drop of oil on a cotton wool bud instead of a pipette)on a 50 year old bottle of Chanel No 5 that has been sealed all its life until tonight! I am thrilled that your advice worked and I am now enjoying the glorious, unspoiled fragrance. I am trying the "Oil & Freezer" method at this very moment. (Monday June 4 9:30 in morn.) My 1st attempt did not work. I was patient and cautious. I am sooo afraid that the very slender glass stopper is going to break off in my hand!! I will post back if i ever do get the stopper out..or don't! FINGERS, TOES AND ANYTHING ELSE I CAN THINK OF ARE CROSSED. Wish me luck! I cannot thank you enough for this tip on removing a stopper. My 2 OZ Baccarat bottle of Shalimar had a broken stopper and was so rudely stuck... a sad aftermath to the 2 oz bottle I received 2 months before this one arrived, as it's stopper unstuck in transit and all of the contents leaked out and arrived empty! Now I had the opposite problem. I tried several fixes to no avail. I added a little sunflower oil with a swab around the stopper and bottle seam, waited my 1/2 hour and then gave it the freeze for another 1/2 hour. The broken stopper finial had just enough left (albeit crumbly glass) to apply a wide rubber band and use my pliers to carefully lift and twist clockwise... the stopper came out after about a half-dozen tries (grips). I am so happy. Now to try this on my full 1000 ml (yeah BIG) bottle of Shalimar cologne next! Thanks again. Im so pleased to hear you found it helpful kate - enjoy that lovely Shalimar deliciousness! Hallelujah!!! THANK YOU for these concrete, effective solutions! My 2 oz. vintage black glass "Boule" of Arpege, with the gold-painted glass ball top & stopper, was FROZEN SOLID. 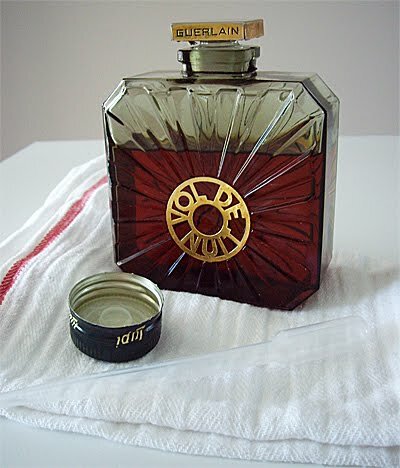 After reading recommendations, it became clear that what I suspected, was in fact true: My large bottle of this 1927 treasure release (date of my boule, unknown), pure extrait, had become "glued" shut with it's own dried juice/oils, just exactly at the snugly fitted glass stopper/neck. Next, I tried running it under hot water (concentrating on the neck area)- more twisting- bigger blister- no luck. Then, I tried the suggestion of taking a sterile dropper, and carefully applying rubbing alcohol just all around the small diameter circle, where the stopper enters the neck of the bottle- AND, I put this in the freezer for 20 minutes... Still, my thumb is severely blistered now, but no luck OPENING the boule! Finally, I threw my hands up in despair, and filled a small child's stainless steel drink cup with 91% rubbing alcohol, (what I had in the medicine cabinet), & inverted my boule in the cup, so that the entire neck area was completely covered & SOAKING in pure alcohol. All was lost anyway, I figured. So... I left it alone, and after a half hour, decided to see what, if anything, had changed... VOILA! I carefully turned it right-side up (inverting & spilling the 1/2 cup of alcohol into another cup), and- Took the boule out, barely grasped the gilded glass stopper top- It opened easily! It turns out, that it was indeed "glued" shut with it's own dried juice & oils, just at the delicate neck- I also learned that ~ 1/2 way down the length of the glass stopper portion (which inserts into the neck), is grooved, running around the diameter of the stopper- THAT's exactly where the "glue set". The alc. dissolved it (yeah!). I took a cotton pad, soaked up some alcohol, & carefully cleaned the entire (intact!) stopper, + inside & outside the neck, all around the bottle, etc. And now, I am wearing my vtg. Arpgege- SCORE! There is no-thing like this deep, dark, explosion of GORGEOUS floral aldehyde w/ civet- Mwa-hahaha!!! Now, I feel a lot more confident about how to resolve this, if I encounter again. That stopper was STUCK / FROZEN for-EVER (I thought). Once my thumb blister heals, all will be well :) omg, it smells D-I-V-I-N-E !!! THANK YOU ! Just received a vintage Caron Nuit de Noel bottle with quite a bit of fragrance but with a stuck stopper. I googled the problem and came upon your site. After sharing the info. with my husband (I am hopeless at fixing things), he sprayed the top with liquid graphite lubricant (very inexpensive in an auto parts/supply store) and then put it in the freezer for one-half hour. After taking it out of the freezer, the stopper came off immediately with no fuss or muss. No vice grips, pliers, drills necessary...it worked beautifully! Im happy to hear the info was helpful, Lee! 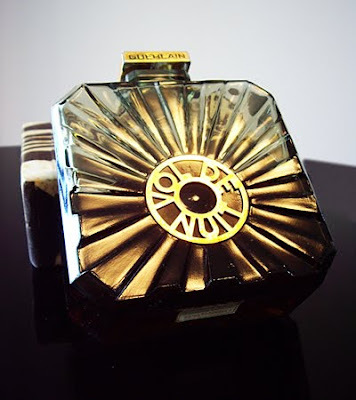 Just unstuck my sixties bottle of Belle de Rauch parfum. All I did was pop it in the freezer for 15 minutes. I suggest trying this first before getting all messy and/ or complicated with oil, glycerin, lubricant or alcohol prior to the freezing. Only after the freezing doesn't work on its own: that's the time to add other steps. Keep it simple! Thank you for sharing. I was actually in a panic mode when I realised that I couldn't budge the stopper of my newly acquired Caron nocturne parfum. I soak the top part in hot water (avoiding contact with the bottle), it remained firmly stuck and my fingers got all red trying to twist it open. Was contemplating to try your method as a last resort until I tried putting it in the freezer. Thank goodness! I managed to get the stopper off with a gentle twist after 10 mins in the freezer. Hope this won't affect the quality of the juice. Again, thank you for sharing all your experiences! Merry Christmas everyone! My epic battle with a "cognac bottle" flacon of Revillon's Carnet de Bal ('37) has finally ended in glory. First, I followed your directions but to no avail. My bottle was in the 1/10 percentile that is immune to such efforts. I then took Zoso Roxy's directions with the isopropyl alcohol. No results there either at first, but after a second soak, which removed all of the paper around the stopper, I was able to pry it off with a wooden spatula. All very scary and frustrating, but I now smell delicious! Normally a little hot water is all I need; however, I have come across the occasional stubborn stopper. In one instance the stopper had apparently already been broken & glued back on before being sold so let's just say there was a Dremel tool involved. I would up gluing the top & stopper back together! 1)With a Q-Tip apply a small amount of olive oil around the seal. 2)Boil some water in the microwave (and I do mean BOIL!!) to a very high temp. 3)Take a tablespoon and pour the very hot water over where the stopper is inserted. This has worked every time except for the broke & glued stopper. When I've come across a stuck perfume stopper, I put it in an ultrasonic (jewelry) cleaner. This worked every time for me. What advice to loosen a stuck sterling silver perfume bottle? it's small, on a necklace. Never had perfume in it, and hasn't been opened in 10 years. Many thanks. OMG, it worked! Tried the alcohol & freezing 20 minutes, nothing. Went to some extra virgin olive oil dropped and spread with a wooden skewer. Back in the freezer for 10 minutes. Wrapped the stopper in tissue and gently twisted with needle nose plyers & pop!!! I have owned this antique jet black sterling encrusted perfume bottle with it's 1/4" ground stopper for 20 years and nothing ever worked...Until now!!! THANK YOU! I read through a few blogs on removing stuck stoppers and just opened two vintage bottles of perfume that I've struggled with for a while. The first was an an extremely old bottle of Joy and the other was a 60's bottle of Shalimar.... back when they made the real thing. I was able to get both off using ice cubes. I put an ice cube on the top of the Joy bottle and held it in place with a soft cloth so I didn't damage the old label. I did pretty much the same with the Shalimar except I used two ice cubes and held one on each side -- also with a cloth so the label was protected. I held onto the bottle itself to keep it warm and waited a bit before giving it a clockwise twist. Both opened up easily. The Shalimar was a dream.... and held the magical perfume I fell in love with. The Joy was only colored water so I'm really glad I didn't try something extreme trying to get to the 'goods' and risk breaking the bottle. An anonymous user above suggested putting the bottle in the freezer for 15 minutes before trying other techniques, as sometimes that's all that's needed. I was doubtful, but decided to try it and met with great success - my 25-year-old bottle of L'Heure Bleue with a "glued" stopper opened with ease after 15 minutes in the freezer (I did wrap the stopper with a thick rubber band for traction). Anonymous - well, its a delicate dance for you with a needle and the bottle upended over a bowl. It can be done, put takes patience and a steady hand. A very old empty bottle with stuck ground glass stooper. Tried every method without success. Had my Ultrasonic cleaner in use cleaning old coins and flash of inspiration, placed bottle on side , poured hot water from kettle (a dash of washing up liquid) covering the neck and 3/4 way over the bottle. Switched on and 30 secs later 'Pop" out came the stopper ! I have a 30 year old bottle of Obsession that I hadn't used in so long that the stopper had frozen solid. I upended it in a little cup of 99% isopropyl alcohol that covered just the stopper - soaked it for 30 minutes. No joy. Put it in the freezer for 20 minutes. No joy. Soaked it again, this time for an hour. No joy. Freezer again. No joy. Hair dryer around stopper after freezer. No joy. Olive oil around stopper. No joy. Yay!!! I used WD40...let it sit for 30 mins...put it in the freezer for 30 mins.....covered the knob with a teatowel, gently secured a pair of wide tooth pliers, turned and pulled!!! Voila!!! Thank you for your guidance!! Your methods work great! I Just freed up the glass stoppers of a lovely 1 oz. Lalique L'Air du Temps and a quarter ounce Caesar's Woman Extraordinary on the first try. Now I will attempt a couple of very old Carons that have been sitting around seemingly frozen forever. BTW I used fractionated coconut oil. 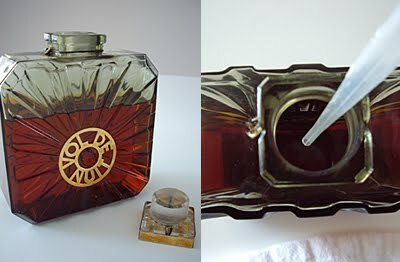 I have a vintage bottle of Caron perfume that has never been opened. It has a screw top cap, which I can remove. The problem is it has a gummy cork seal that is jammed down the small opening and I have no idea how to remove it without just pushing the whole thing down into the bottle. Any suggestions? The small bottle was beautiful with a glass stopper and was sent through the post from the US unfortunately I couldn't open it. We emailed the vintage perfume company for tips on opening the bottle, they didn't work. I can't wait to try this. I just received a 1939 Chanel No 5 from the "Three Moods" collection (small bottle, oval stopper) and it's not playing nice. It's never been opened--I had to take off the cord and onion-skin paper seal! Wish me luck!